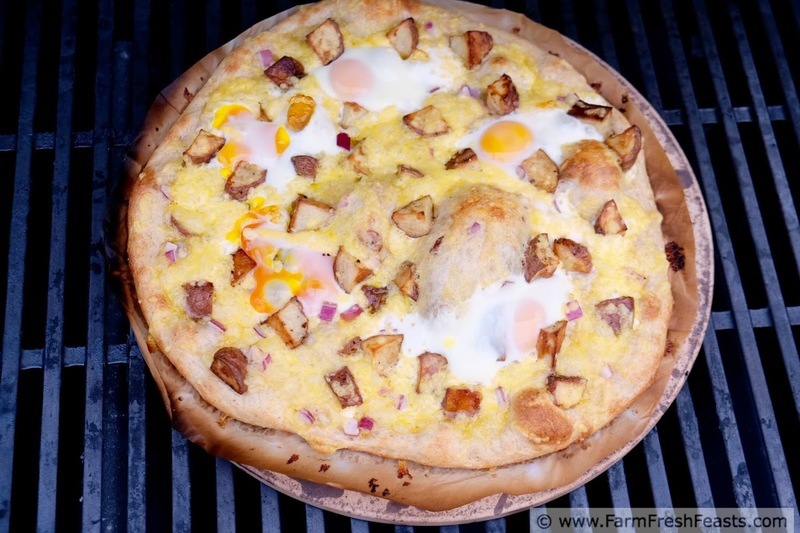 This grilled pizza recipe combines fresh eggs with roasted potatoes and a thick layer of creamy gouda cheese. In addition to the Strategic Winter Squash Reserve, potatoes are one of the longest-storing vegetables from the Community Supported Agriculture (CSA) farm share. During the late winter I've got a few carrots in the crisper, lots of vegetables put up in the freezer, as well as potatoes and winter squash in the basement Strategic Winter Squash Reserve. One of the ways I'm feeding my family locally-grown produce year round, even while we live in an Ohio that doesn't know if it's winter or Spring this week. When I roast potatoes I always roast a bunch more than I think we'll eat. It's part of the whole 'cook once eat twice' routine. My daughter will eat leftover roasted potatoes for breakfast or snack (sometimes after checking to see if I planned to use them for a dish, sometimes not bothering to check). 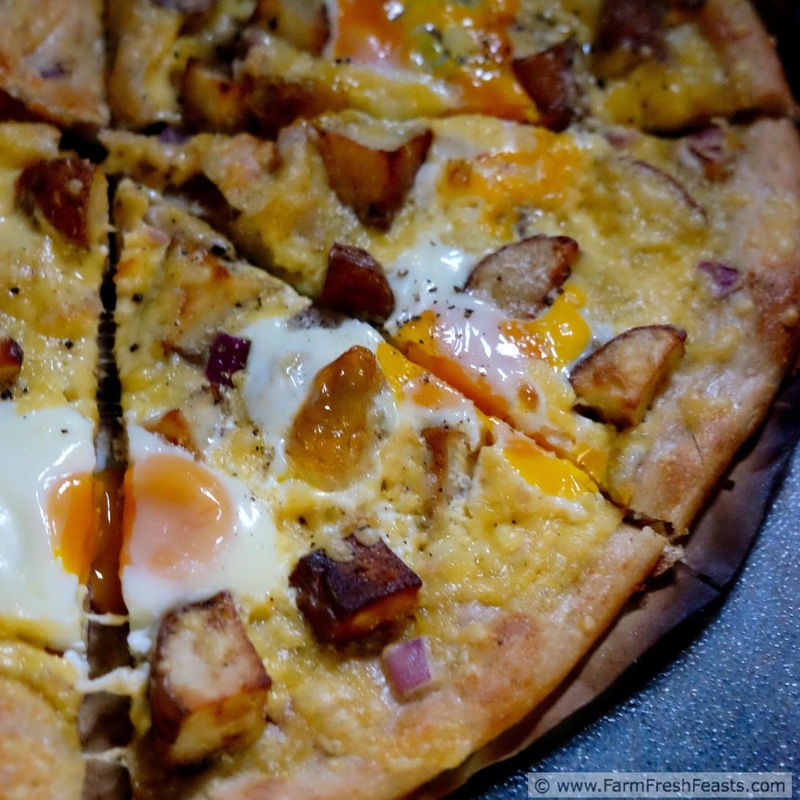 When I put leftover roasted potatoes on a pizza I want to make sure I'm cooking the pizza fast so the potatoes don't dry out. Tossing the potatoes with olive oil and covering them with cheese helps. Heck, covering many things with cheese helps. Perhaps not the dust & dog hair bunnies . . . 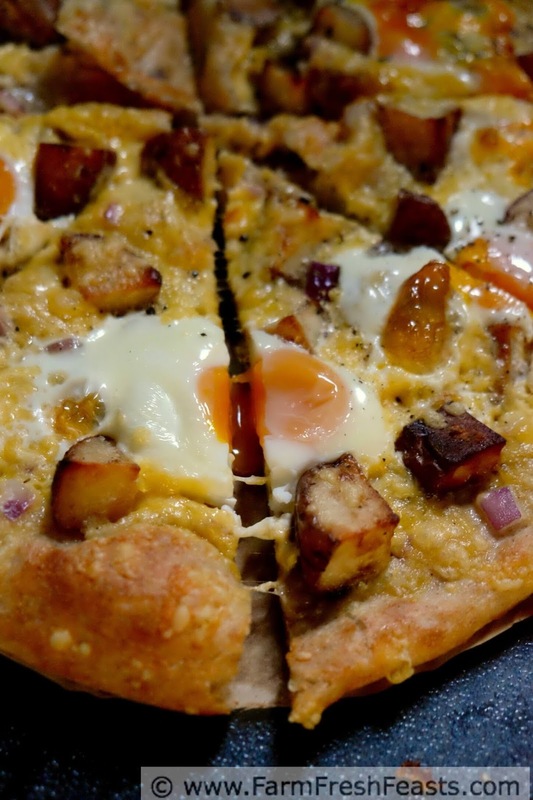 I chose to share this pizza now because the eggs made me think of Easter. I like seeing photos of Facebook of my friend's new chicks--they are so interesting and cute and varied looking, it's no wonder their eggs will all end up varied and interesting looking as well. For more recipes using potatoes, please see my Potato Recipes Collection. It's part of the Visual Recipe Index by Ingredient, a resource for folks like me eating seasonally (and no, that doesn't mean just Cadbury Creme Eggs) from the farm share, the farmer's market, garden & grocery abundance. I'm sharing more pizzas on my Visual Pizza Recipe Index, and this will go in the Vegetarian Pizzas category. 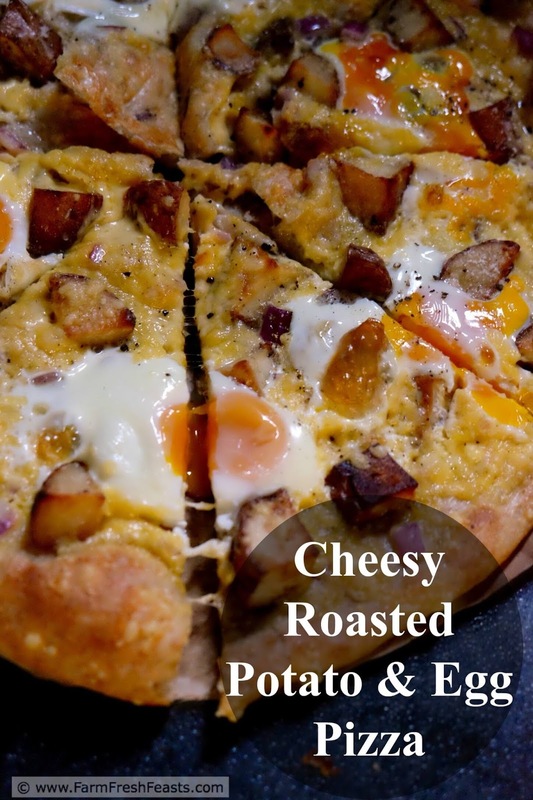 If you're into Pinterest, I pin interesting pizzas to 2 boards, so follow me on Pinterest. I'm sharing articles and recipes on my FB page, follow me there. And I just learned of the hashtag #dailypizza so I may try that out on Instagram, but for behind the scenes photos follow me on IG. Want to know How To Use This Blog? Once I survive using the Self Clean function on my oven, without blowing up the house [note to self, do that before it gets hot--and stays hot--outside] maybe I'll be more comfortable cranking my oven to 500 degrees. I don't want to burn the house down. It's been standing for 87 years. Refer to my Pizza Primer for a step-by-step photo tutorial on how I make pizza at home. On an oiled piece of parchment paper (seriously, so worth it) stretch out the dough into the shape it feels like assuming today. Brush crust with a bit of olive oil. Take your time, we're not in a rush. Scatter cheese and onion across the top. In a medium bowl, toss potatoes with a teaspoon of olive oil. 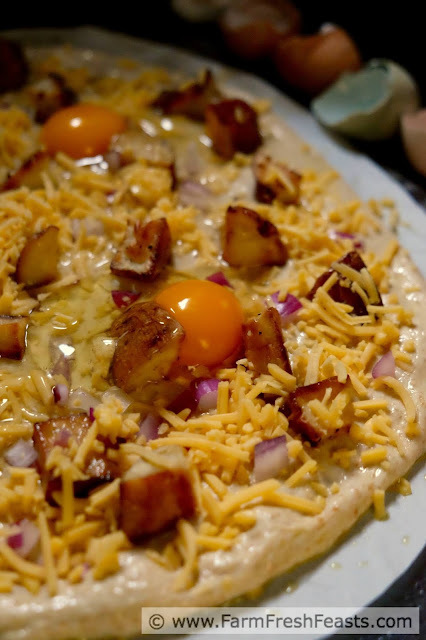 Place potatoes on top of cheese, evenly spaced around the pizza. 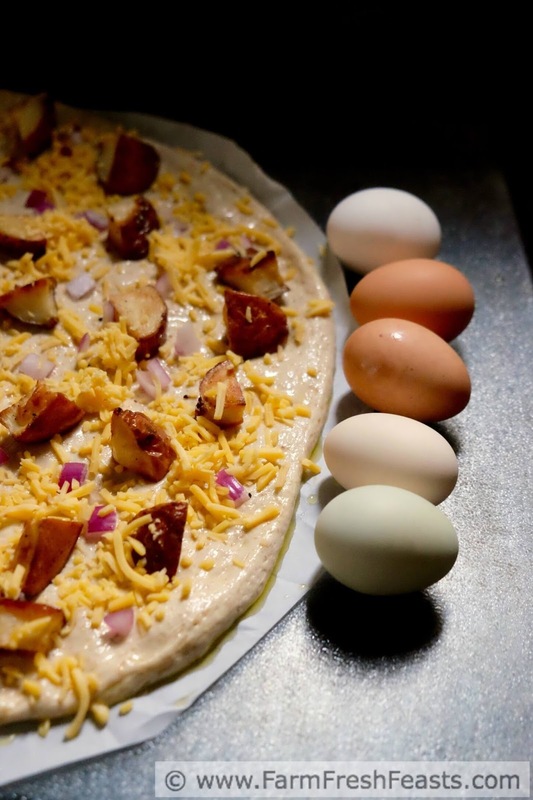 Crack the eggs around the outer half of the pizza as shown. Season the pizza with a generous pinch of salt (I use kosher) or two and several grinds of pepper. Using a cookie sheet, slide the parchment paper+topped pizza onto the hot stone. Close the grill. Wait 5 minutes. Open the grill. The pizza should be done (crust browned, cheese melted and bubbly, whites of the eggs cooked). If you think it needs a bit more time, close the lid and check it again in another minute or two. Slide the cookie sheet under the parchment and remove the pizza from the grill. Slice (Amazon affiliate link to my slicer) and serve. I need more potatoes. I'll have to hit the store, or maybe look at the farmer's market today when I'm getting eggs and the most amazing giant pretzels ever. Oh! And a birthday present for my girl shhh--don't tell.